Thank you for choosing Miss Efficiency and we look forward to working with you. There are some items that you should be aware of in terms of our engagement, which are itemised here. If you have any questions, please feel free to contact us to discuss further. Keep in regular touch and do not hesitate to ask for a progress report if you are concerned about any aspect or do not hear from us when you expect. Miss Efficiency will not at any time disclose to any third party any information that is identified as confidential without your consent or unless required to by law. We will protect such information and treat it as strictly confidential both during the engagement period, and after termination of the engagement. It is a legal requirement that we inform you about any client information we are disclosing, and to whom and where the disclosure will be made in the course of performing our duties. Depending on the services that we provide for you, we wish to advise that some of your information may be disclosed to third parties as listed below. Backup services – Information stored for back up purposes. Financial Institutions – Supplier and employee payment information. Third parties – Information provided for the purposes including but not limited to storing information, transferring information, communicating about client affairs. Government Departments, state and federal – Information relating to the client and its employees including but not limited to the Department of Human Services, Centrelink, Child Support, Medicare, Australian Taxation Office, Office of State Revenue, Workcover. Software Providers – Information stored within the software including but not limited to the result of data entry, reconciliations, source documents. Software Providers means the primary software used to capture the accounting records and other related and/or integrated software to assist with capturing that information and providing services to you. Subcontractors and employees – Information necessary to perform services including but not limited to process information, source documents, accounting files, bank statements, timesheets. Superannuation Funds & Superannuation Clearing Houses – Information for the lodgement and/or payment of superannuation including but not limited to contact information, employee information, bank details. Workforce Guardian – Information necessary in obtaining HR assistance including but not limited to contact information, employee information, payroll information, process information. If you fail to pay a Miss Efficiency invoice in accordance with our payment terms we reserve the right to cease your work immediately and without penalty. We reserve the right to invoice for any outstanding work in progress and hold all working papers, source documentation and subscriptions until payment of the account is received in full. Overdue invoices may be referred to a debt collection agency and any costs associated in recovering the debt may be passed onto you. Where we process supplier and/or employee payments on your behalf, it is agreed that we will process our invoice/s for payment with your supplier and/or employee payments in the next payment run. We reserve the right to review fees for services rendered on a regular basis. Our prices and package rates are subject to change and will be reviewed on a regular basis. The extent of the record keeping function performed by Miss Efficiency will vary depending on the engagement and will be agreed during the course of the appointment. It will be your responsibility to ensure the completeness and accuracy of the records and information supplied and to provide explanations on any item questioned in the course of the engagement. This is necessary to ensure the accuracy of the financial information compiled under this engagement. Responsibility for the maintenance of business records rests with you. This includes security of those records and prevention against cyber-attacks and fraud. It is important to remember that you are personally responsible for the information contained in any statutory return and that you must retain all necessary supporting documentation to substantiate the transactions. While we will perform periodical local backups of bookkeeping work for our own records, you should ensure all your business electronic data is backed up securely. Represent themselves as BAS Agent for the business. All relevant documentation and information required to allow us to prepare and produce financial reports to comply with legislative requirements must be received 21 days prior to due lodgement dates. We will not be liable for any penalties if documentation and information has not been provided within this time frame. As a BAS Agent, we have an additional 28 days to lodge quarterly Activity Statements. This authority relates to all accounts in the business name, and/or used for business purposes, where bank feeds are available. We will establish the payroll system based on the information provided by you. We will implement and maintain the payroll system based on this information. You have not engaged Miss Efficiency to interpret and apply the FairWork provisions for your business. Any information we provide in relation to FairWork or Awards is our interpretation only and should be independently verified before implementing. When new employees start, please provide us with a copy of the TFN Declaration, Super Choice form, position, Award, classification, pay rate and any penalties applicable, plus any other information necessary for us to process payroll on your behalf. Whilst we may process your wages, we are not HR specialists and are not abreast of all Award and workplace relations information and changes. It is important that you are aware of the obligations mandated by the Fair Work Act, and your modern award or industrial agreement. We’d recommend you perform regular workplace audits to ensure minimum legislative obligations are being met. You should be aware that sometimes things change so please ensure you are complying with minimum employment standards. Information can be obtained from your industry association, or Fair Work Australia. Industrial relations is a complex area. We are a member of Workforce Guardian where we can obtain HR advice for some payroll matters in your business. The turnaround of advice can take a few days so please ensure enough time to obtain advice before it needs to be implemented. We may be engaged to make payments for the business and have access your bank accounts/s. This could be to review transaction history, download bank statements, and/or pay suppliers and/or employees and/or customers. You may have also provided us with authority to lodge superannuation on your behalf where the superannuation fund will take a direct debit from your account after lodgement. Any transactions we do where money is leaving your account, we must be provided with authority. This could be by way of: upon your instructions we upload payment to your bank ready for you to disburse the funds; upon your instructions we upload payment to your bank and you provide us with an SMS authority code to disburse the funds; upon your instructions we upload payment to your bank and you provide us with email confirmation to disburse the funds; we upload payment to your bank and disburse funds on the understanding that all supplier invoices and employee timesheets sent to us are authorised for payment; upon your instructions we upload information to your superannuation fund or clearing house for them to direct debit your account. It is your responsibility to ensure the accuracy of payment information before we make the payment and Miss Efficiency will not be held liable for any errors or omissions made. Where we have been authorised to process and/or pay supplier bills on your behalf it is agreed that we have the authority to contact your suppliers for information including but not limited to their contact information, bank details, invoices, statements, account history, provide remittances. Please ensure valid tax invoices are obtained where required and valid proof of payments exist for all payments that are being claimed for GST/BAS purposes. We may seek further information where it is an unusual transaction or where the information is unclear, and we may provide you with a list of queries for your action prior to completing your accounts. Please ensure you review the reports we send to you so that any amendments can be made in a timely manner. The responsibility for reviewing final reports and/or work rests with you. You will not be charged to correct errors which are clearly our fault, as long as you provide us with written information and evidence of such errors within 7 days of receiving the reports and/or completed work. Revisions performed at your request will be charged separately at an agreed rate. Miss Efficiency may from time to time provide you with various precedent documents, and other information which could be used by you in the conduct of your business. These documents may include but are not limited to precedent Agreements, Policies, Procedures and Letters. They are not intended to replace legal advice from your own Lawyer or Industrial Relations Advisors. It is strongly recommended that before you use any of these documents or systems that you obtain your own Legal or Industrial Relations advice to ensure that they are appropriate for your particular circumstances. Miss Efficiency is not a legal advisor, nor Industrial Relations advisor, and has provided this information only as a general guide as to the types of systems and documents which you should put in place in your business. The financial statements and any other documents that we are specifically engaged to prepare, together with any original documents given to us by you, are your property. Any other documents brought into existence by us, including general working papers and draft documents remain our property. It is agreed that all materials provided to Miss Efficiency are owned by you or you have the permission from the rightful owner to use such materials, and you will hold harmless, protect and defend Miss Efficiency from any claim or action which may arise from the use of such materials. If Miss Efficiency holds the subscription for your accounting software, we reserve the right to restrict access to the file due to non-payment of our account. If you wish to take over the subscription all outstanding fees to us must be paid prior to transfer. Ownership of the data becomes yours following payment of the respective fees. If you choose to discontinue our services including the provision of software through us, we shall cease paying the software subscription and information will no longer be available unless reinstated within the terms stipulated by the software provider. Please be aware that many software companies include in their terms and conditions the right to access your data. By giving me access to your business data (whether through my subscription or your own), you also acknowledge and accept the terms and conditions of the software provider/s. Whilst Miss Efficiency makes every effort to provide accurate and reliable information and services, we reserve the right not to be held responsible for the correctness, completeness or quality of the information and services provided. We assume no responsibility for consequences resulting from the provision of information and services, including, but not limited to, errors or omissions. All information provided is intended solely to provide general guidance on matters of interest for your personal use and you accept full responsibility for its use. It is provided with no guarantee of completeness, accuracy or timeliness, and without warranty of any kind. Information provided does not constitute legal, industrial relations, accounting, tax or consulting advice. You agree to indemnify us for any loss that may result from third party claims arising from the provision of our services. Electronic mail may not always be secure and any files transmitted may, among other things, be copied, recorded, read or interfered with by a third party while in transit. If we transmit any file electronically, you agree to release us from any claim you may have as a result of any unauthorised copying, recording, reading or interference with that document after transmission, for any delay or non-delivery of any file and for any damage caused to your system or any files by a transmission. Please note that it is not our policy to open links within emails due to the increased number of malicious emails. Our services are varied and our work is performed both onsite and offsite for our clients. In the instances where we are required to work at your premises, Miss Efficiency will take all due care and consideration to ensure no loss and/or damage occurs. However, we shall not be held responsible for any loss and/or damage incurred whilst at your premises. When working onsite we expect a reasonable working environment which includes a safety regulated chair, office space and non-smoking area. Employees and/or contractors may be utilised to help complete the agreed work as required. The Institute of Certified Bookkeepers Code of Conduct binds all representatives of Miss Efficiency, which is inclusive of confidentiality agreements as per the Terms of Engagement in this document. 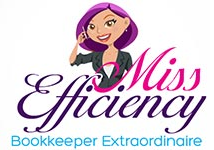 Miss Efficiency is an independent contractor, not an employee. As such, you are not held to the obligations of an employer such as superannuation, annual leave, payroll tax, etc. However, the following rights are upheld, consistent with an independent contractor status. These include the right to perform services for others during this engagement; the right to control and direct the means, manner and method by which the services are performed; the right to hire assistants and use employees to provide the services required. This engagement does not create a partnership relationship; you, nor we, have the authority to enter into contracts on the other’s behalf. This engagement may be terminated at any time by either party. In the case of termination, you agree that payment for all services accrued up to and including the date of termination will be paid immediately upon receipt of our Tax Invoice. If you are on a weekly/monthly recurring package, one month notice is required. If you have paid for an annual service, services will terminate at the end of the engagement period and one month notice is required. On termination of our agreement, it is the policy of Miss Efficiency to retain client information for a period of five (5) years from the date of termination of our services. Where we subscribe to software on your behalf, the software subscription will be terminated or transferred over to you.